On Wednesday, January 28, 2015 it was early afternoon during the trading day and I arose from my screens to go grab a drink out of my refrigerator. In the process of grabbing a drink, I went out to see what came in the mail and to get a few moments of fresh air before the final hours of a fairly quiet trading day were through. Upon reentering my office, I noted that my screens were flashing red and the S&P 500 was under assault from the sell side. I scanned several independent blogs I follow for a headline and came across nothing. It was at this moment that I did the unthinkable and I turned on CNBC. I am embarrassed to even admit it frankly, because the drivel CNBC and most of the financial media spew out might as well be sales material for the sell side and their “long-term investment view that is always bullish”. 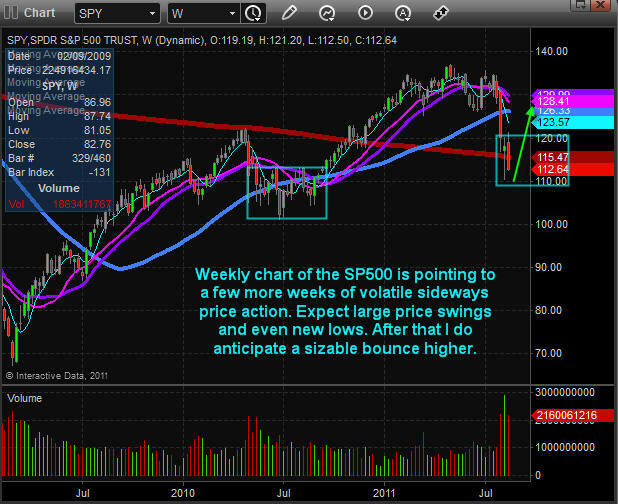 I saw the S&P 500 under pressure and then a subsequent bounce occurred. Nothing major, not even what I would call a major retracement, just some short sellers locking in a few profits I presumed. To my absolute horror, seconds later I recall seeing the headline at the bottom of the television screen on CNBC dictating that “stocks were off their lows”. It is no wonder CNBC’s ratings are absolutely terrible. Regardless, I am an options trader who has weathered the storm fairly well. I sell premium, focus on implied volatility, and I use probability to build my trades. My style is similar to Tom Sosnoff’s for those following him on TastyTrade or Dough, but I mix in a few twists. Regardless of my trading style, I have a strong historical track record that I am proud of which has handily beaten the markets for several years, although 2014 was one of my worst year in recent memory. The reason I mention this is simply to state that I am a trader first, and newsletter operator second. I am getting rich with my newsletter at $20 per month let me tell you. Honestly, I just send out trades. No fluff, no nonsense. I tell it like I see it and I admit when I am wrong. My trades typically have a 60% – 70% probability of success at the time of entry based on implied volatility calculations involving probabilities. At the end of the day, I trade options because I am a junkie . . . I absolutely love derivatives and trading them. As such, some of my recent research at various independent blogs paired with what I can see in the options marketplace has led me to believe that the S&P 500 Index (SPX) is going lower in the next 6 – 12 months. I want to be clear that I am not calling for a crash nor am I saying that the S&P 500 Index will remain under pressure, I am just simply calling for a correction in the very near future, although the situation could deteriorate into something much worse potentially. 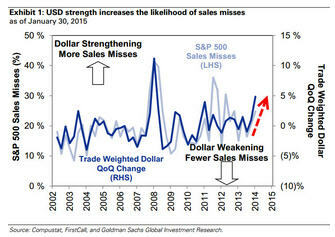 “Anecdotally, management commentary implies the dollar strengthening will lower revenue growth by 300-500 basis points. Foreign sales accounted for 33% of aggregate revenue for the S&P 500 in 2013. Based on our earnings model, a 10% strengthening of the trade-weighted dollar lowers S&P 500 2015 EPS by about $3.” To dig deeper into this, click HERE to view the entire article. So according to more than one article on zerohedge.com, the fundamental picture for earnings is being weighed down by a strong U.S. dollar. 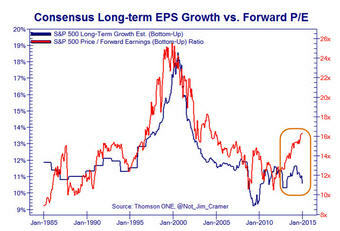 The earnings and valuation backdrop in the same article is also concerning in the intermediate to longer-term. 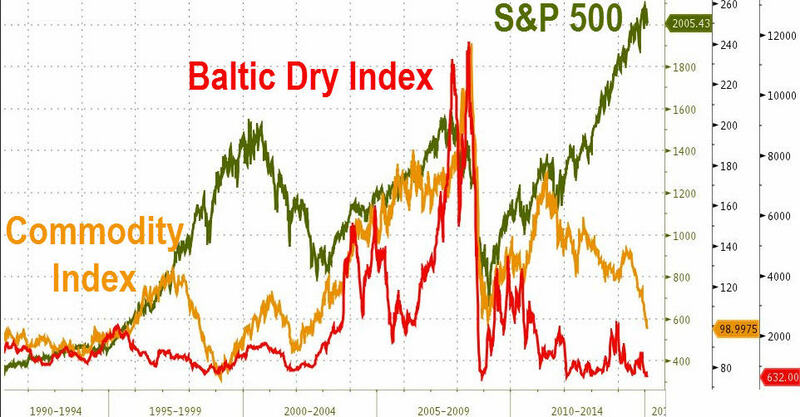 Lastly, when looking at the correlation between the Commodity Index and the Baltic Dry Index, we see a sudden shift that places the S&P 500 Index in a major divergence compared to historic norms. Now that I have leaned heavily on zerohedge.com to handle the fundamental side of my research, it is time to dig into the derivatives side of the trade equation. When looking at the S&P 500 Cash Index Options (SPX), another interesting observation is notable. When looking out to the June monthly expiration and Friday’s closing price in the S&P 500 Cash Index of 1,995, an interesting standard deviation skew appears. The June 1,525 Put is exactly 2 standard deviations from the current price on the downside. 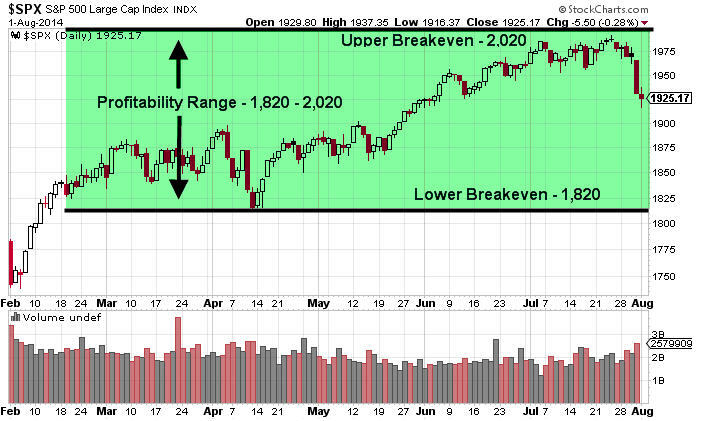 The June 2,200 Call is also 2 standard deviations from the current price. 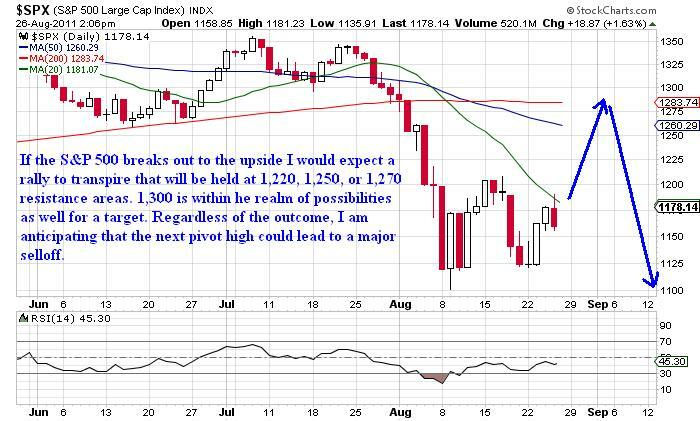 This means that the market is pricing in about 205 points of upside or about 10.27% potential upside. Conversely, the two standard deviation move to the downside is roughly 400 points or about or roughly 20.04% potential downside. I would point out that the marketplace is pricing in a move of almost 2 times the severity on the downside in the S&P 500 Cash Index options. Pair this market expectation with the fundamental data discussed above, and the potential for serious downside does exist. I want to be clear that I am already leaning short the S&P 500 Cash Index (SPX) in my portfolio as my beta weighted Delta against the S&P 500 Cash Index (SPX) is negative overall. However, I have not taken an actual short position in the S&P 500 Cash Index (SPX) or its cousin, SPY . . . at least not yet. However, after seeing the U.S. Dollar strengthen recently I was able to enter a February call credit spread in EEM (Positive Time Decay / Profitable if EEM moves lower) for the members only portfolio. That trade will likely be closed for some strong profits in a short period of time. The option trade was taken on January 23rd for a credit of 0.37 per spread. Members of our ETF trading newsletter also has a position in an emerging market fund that is setting up for potential 60% move! The trade could have been closed on Friday for 0.06 debit per spread. The difference, representing the profit on the trade is 0.31 or $31 per spread. The maximum risk per spread was $113, so the actual return based on maximum risk was 27.43% based on Friday’s closing prices. While this is a great return, not every trade works this well and produces profit this quickly. While I will be locking in profits in the EEM February Call Credit Spread early this coming week, I intend to take a similarly bearish trade in the S&P 500 in the near future. I may look to go out as far as March expiration to take in additional premium and to buy myself a little more room on my upside breakeven price. However, I will likely move the overall portfolio to a slightly more negative bias in the near future. Going forward, when I highlight trades I intend on discussing the trade structure used in the future as well as an ongoing account as to which trades were profitable and which trades did not work. I am excited about the service I am offering and the new, no-nonsense pricing model. I realize newsletters are really a dying business model, but I simply have too much fun writing about my trades and running the service. Granted a little extra spending money never hurt anyone, but I am having too much fun to quit! By now it is no secret that equity markets continue to deliver solid gains for 2014. In fact, all of the major U.S. domestic stock market indexes are higher for the year. U.S. equities have benefited from an accommodating Federal Reserve, massive corporate stock buy-back plans, and solid earnings growth. The bullish trend which began in early 2009 has pushed equity indexes to several all-time highs. However, when we focus our attention on 2014 one index is showing major relative out performance. The Nasdaq Composite and the Nasdaq 100 indexes have blown away every other major index in terms of overall returns in 2014. 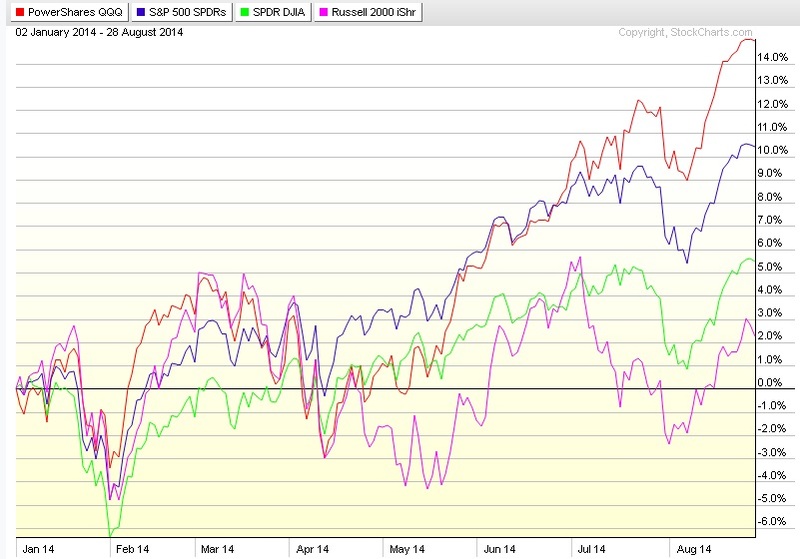 The chart shown below illustrates the returns of each major U.S. equity index year-to-date. As can be seen above, when looking at the corresponding ETF for each major index, the Nasdaq 100 (QQQ) is running away from every other major index in terms of performance. As a contrarian trader, I am of the opinion that now may be an excellent time to consider looking for a possible short position to hedge against the bullish trend. The equity markets in the United States are becoming frothy and prices are at the very least fair valued if not overvalued depending on which methods are used to calculate current prices. When we consider the major out performance in the Nasdaq 100 Index, it would only make sense that if we see downside in the future we could capture some big potential profits. As an option trader who focuses primarily on probabilities for trade executions using a variety of implied volatility calculations and Delta assumptions, the following observations regarding the Nasdaq 100 Cash Index (NDX) were derived based on data points on Friday, August 29th. Based on the September NDX option expiration date, the current skew in the NDX option data is to the downside. In fact, as I am typing this NDX is trading around 4,075. A 2 standard deviation move to the upside (90%) is around the 4,200 call strike and the same measurement to the downside is around the 3,900 put strike. When looking at the same data based on the October NDX option expiration date, the current skew in the NDX option data demonstrates more aggressive downside Skew in October versus September. A 2 standard deviation move in the October series to the upside (90%) is around the 4,275 call strike and the same measurement to the downside is around the 3,755 put strike. While I realize this is somewhat technical, the main premise is that the option market in the Nasdaq 100 Cash Index (NDX) is skewed toward more potential downside risk. This data lead me to place a new trade earlier this week which was next short the Nasdaq 100 Cash Index (NDX) using an October Call Credit Spread as a trade structure. Recent results for the service have been very strong for the options alert service. The last 4 trades have produced a 13.95% winner in Matador Resources (MTDR), a 17.05% winner in the S&P 500 Cash Index (SPX), a small 1% loss in the Nasdaq 100 (QQQ), and a 21.95% in the Russell 2000 Cash Index (RUT). The options newsletter service is priced super affordable at just $29.99 per month with new trade alerts sent out almost daily. Ultimately time will tell if the skew in the NDX proves to work. For now, I like the near 75% probability of success that the NDX Call Credit Spread is offering with a nearly 20% potential return. In the future readers can expect a recap of this trade. Happy Trading! Most traders follow the S&P 500 Index closely, but few equity or futures traders are able to structure trades that are profitable based solely on the passage of time. Option traders use a variety of trade structures, called credit spreads to actually make the passage of time a profitable endeavor. Unfortunately there is one catch . . . the price of the underlying asset has to cooperate. What many readers may find interesting is that I structure my option portfolio around being positive Theta. This essentially means that the portfolio collects option premium as time passes which will be converted into profits if prices cooperate. I attempt to consistently capture close to 1% of my account value per day in positive time decay. Inquiring minds might ask how I accomplish this task. The answer: multiple iron condor spreads. An iron condor spread is a credit spread where a trader takes a call credit spread and a put credit spread simultaneously. 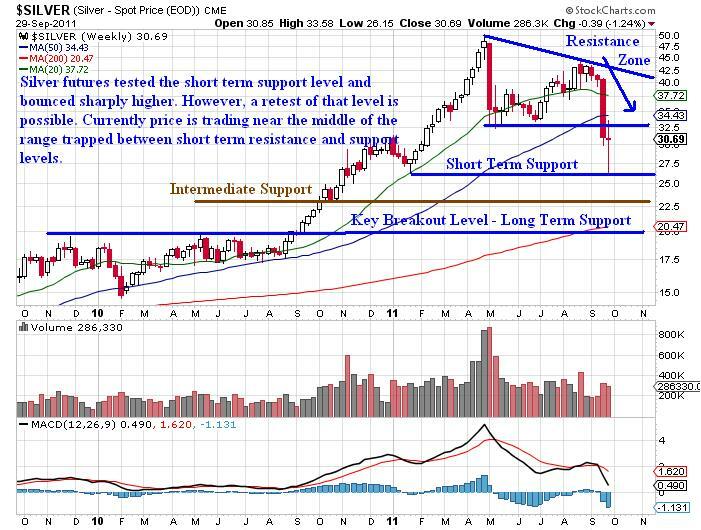 In many cases, the trader expects the underlying asset to consolidate or trade in a specific range. I have several high probability iron condor spreads in my portfolio all the time. I trade the same trade structure using the same underlying assets over and over again. In many cases, I will have more than one iron condor spread on the same underlying asset on my books at the same time. The underlying assets that I focus my iron condor strategy around are primarily index options and index etf’s. I trade the S&P 500 cash index (SPX), the Russell 2000 cash index (RUT), the Nasdaq 100 ETF QQQ, and the Dow Jones Industrial Average ETF which is DIA. These are just a few of the underlying assets that I trade using the iron condor strategy. I traditionally enter the trades at about 50 days to expiration using a probability of success of around 80%. Most of the time, the broader index would have to move roughly 2 standard deviations from the current price at entry to create losses in my portfolio. Back in early July I entered an August SPX Iron Condor Spread which presently is boasting profits of around 10% on maximum potential risk. However, I wanted to show readers that recently I entered a September SPX Iron Condor Spread with about 50 days to expiration. The probability of success was around 80% for the trade to be profitable. The following chart of the S&P 500 demonstrates the price range where the new September SPX Iron Condor Spread will be profitable if held to expiration. As can be seen above, the new September SPX Iron Condor Spread is profitable as long as the SPX price stays between 1,785 – 2,050. The trade was entered on July 22nd in addition to the August SPX Iron Condor Spread that I was holding at the time. The chart below shows the price range in the S&P 500 Cash Index (SPX) which will be profitable if both SPX iron condor spreads are held to expiration. If both SPX spreads are held to expiration, the profitability range for both trades held simultaneously is 1,820 – 2,020. The probabilities are quite favorable that one if not both trades will be profitable at the August and September expirations. The combined strategy offers a probability of close to 80% to make a positive return. Based on maximum possible risk, the typical return is between 10% – 15% depending on implied volatility changes during the holding period of the trade. At first glance, many traders write this strategy off as a poor strategy based on risk / reward. However, what other strategy offers nearly a 10% – 15% return on maximum risk with a near 80% probability of success at the time of entry? When paired with other directional trades, having multiple, high-probability iron condor spreads on the books at the same time builds a high level of positive theta that helps support consistent portfolio profits. So far, the recently launched Technical Traders’ option service is boasting two closed trades thus far. Both trades that have been closed were quite profitable. The first winning trade was in Facebook which was directional biased to the upside and a call diagonal spread was the trade structure chosen to use. The trade had a maximum risk of $493 per spread and produced a gross gain of $111, or 22.51% per spread. The other big winner was a FXE Put Butterfly Spread which was designed to profit partially from the passage of time and from lower FXE prices. The trade was entered with a maximum risk of $141 per spread and produced a gross gain of $53, or 37.59% per spread. US Equities opened higher this morning and are setting up for a sharp pullback based on technical analysis using trends, cycles, momentum, volume, market breadth and key resistance zones. 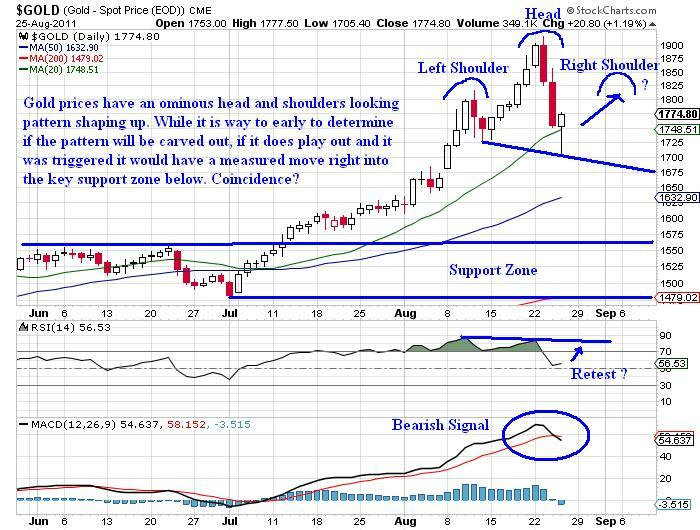 Take a look at the charts below for a quick flash of what I think. This chart I look at daily. In short if its price is at 101 or higher I expect the broad market to pause or pullback within the next day. It tells me if stocks have moved to far in one direction on a daily basis and if so sellers (big money players) are likely to re-align stocks by taking profits or shorting during these times. Here we can see that while the SP500 has been rising over the past 6 months less stocks are trading above their 50 day moving average. This means a smaller group of stocks is holding the market up and it’s just a matter of time before those stocks burn out and roll over also. With the SP500 breaking down from its trend channel and testing a short term resistance trend line. Odds favor sellers should become more active and pull the market down as they unload any remaining long positions and possibly get short the market. Both of these actions will put pressure on US Stocks. 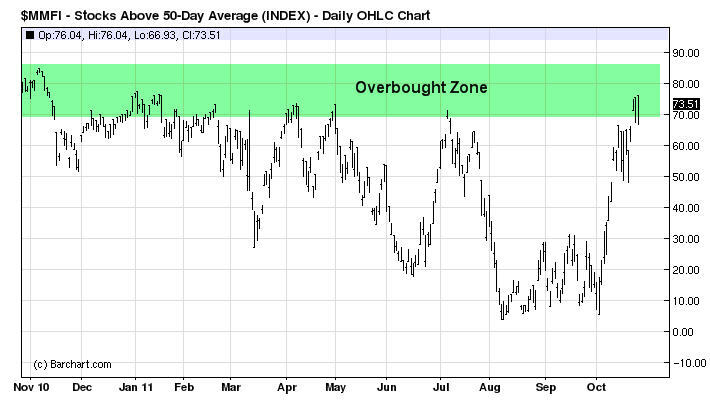 Big Picture Outlook – Don’t Get Me Wrong! This chart is just to show you what is possible. 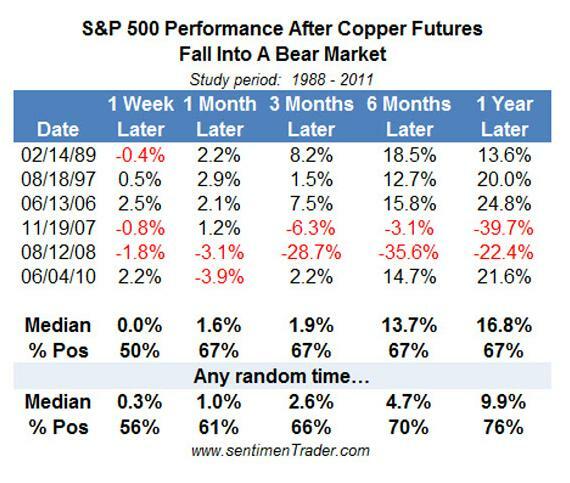 I am not a perma-bear nor do I want another bear market like this to happen. But knowing what is possible still has to be known. 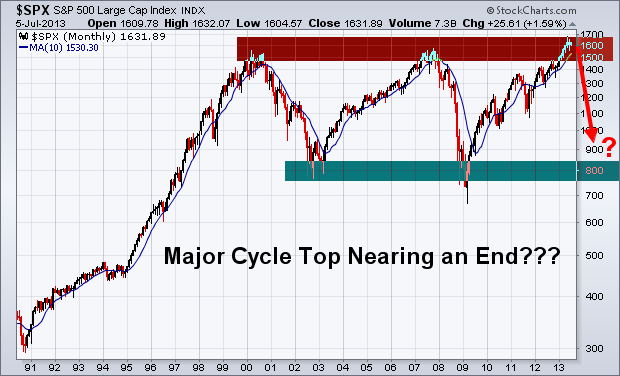 Major market tops are a lengthy process and tends to take several months. 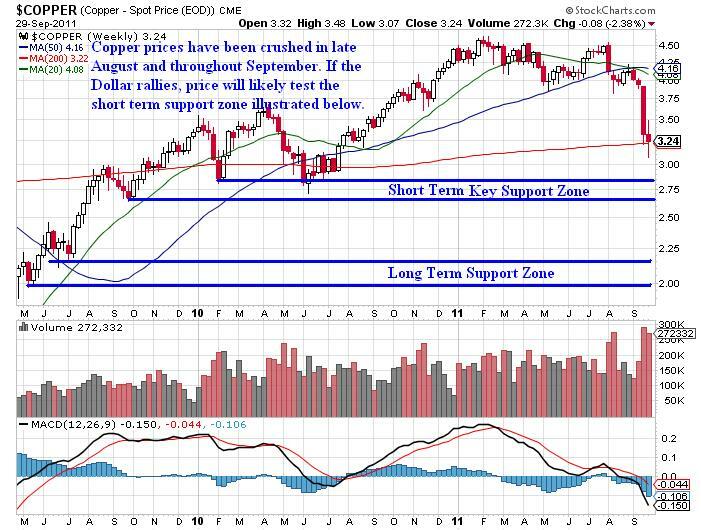 If this is the case then it could be a wild and choppy market for the rest of 2013 and a great way to play this is through writing options. Do not expect price to just collapse and free fall for 18 months… Dreams like that do not happen. Bear markets must be actively traded as they carry a lot of risk. This week is do or die for US stocks. We need sellers to step in here and pull stocks down. With the SP500 trading at resistance, stocks being overbought on a short term basis and the holiday week behind us which typically favors higher prices it is now time for sellers to become active once again. “You can’t feel the heat until you hold your hand over the flame. Friday morning traders and market participants awaited the key January employment report from the U.S. Bureau of Labor Statistics. The reaction to the supposedly wonderful report was a surge in the S&P 500 E-Mini futures contracts as well as several other key equity index futures. The overall tenor among the financial punditry was predictable as wildly bullish predictions permeated the morning session on CNBC and in the financial blogosphere. However, after the report had been out for several hours notable independent voices such as Lee Adler of the Wall Street Examiner came out with information that suggested the numbers were an apparition of manipulated statistics. I am not going to spend a great deal of time discussing the report, but the reaction to the news was decisively bullish on Friday. The question I want to know is whether Friday was a blow off top? In the recent past the S&P 500 has seen several key inflection points and intermediate-term tops form on non-farm payroll monthly announcements. I follow a variety of indicators to help me decipher more accurately when the market is getting overbought or oversold. For nearly two weeks the market has been extremely overbought, but now we are reaching truly astonishing levels. 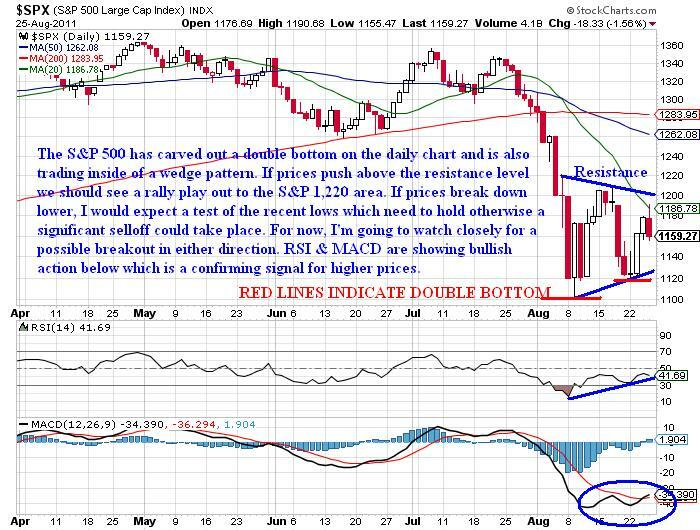 The following charts represent just a few signals that the market is due for a pullback and a top is likely approaching. The chart above clearly illustrates that as of Friday’s closing bell (02/03) over 89% of stocks were trading above their 50 period moving averages. Consequently that reading is one of the highest levels that we have seen in the past 3 years. In addition, over 73% of stocks that trade on the NYSE are currently priced above their longer-term 200 period moving averages. Another extremely overbought signal. The S&P 500 Bullish Percent Index is another great tool for measuring the overall position of the S&P 500. It is without question that the longer term time frame is reaching the highest level of overbought conditions in the past 3 years. The two charts shown above present an interesting situation regarding the divergence in the McClellan Oscillator and the price action in the S&P 500. The most recent example of this type of divergence occurred in October of 2011 and prices immediately reversed to the upside after several months of selling pressure. In fact, this correlation between reversals in the S&P 500 and divergences in the McClellan Oscillator works relatively well historically. Clearly there are bullish voices arguing for the 2011 S&P 500 Index high of 1,370.58 to be taken out to the upside in the near future. Additionally, several market technicians in the blogospere have been pointing to the key resistance range between 1,350 and 1,370 on the S&P 500 as a likely price target. Obviously if those price levels are met strong resistance is likely to present itself. However, as a contrarian trader I have found that the more obvious price levels are the more likely it is that they either will not be tested or they will not offer significant resistance. It is obvious that Chairman Bernanke and the Federal Reserve have embarked on a massive fiat currency printing campaign which has helped buoy risk assets to the upside. Through a combination of reducing interest rates on safety haven investments like Treasury’s and CD’s, the Federal Reserve has forced conservative investors and those living on a fixed income into riskier assets in search of yield. This process helps elevate stock prices and creates the desired outcome for the Federal Reserve which involves the perception by average individuals that they are wealthier. The Fed calls this the “wealth effect” and they seem poised to insure that U.S. financial markets continue to ride upon a see of cheap money and liquidity. Ultimately the Federal Reserve’s most recent announcements have served to help flatten the short end of the yield curve further while providing a launching pad for equities and precious metals. However, issues persisting in Europe could have an adverse impact on the short to intermediate term price action of the U.S. Dollar. Right now everywhere I look I hear market prognosticators commenting on how hated the U.S. Dollar is and how Chairman Bernanke will not allow the Dollar to appreciate markedly in order to protect U.S. exports and financial markets. I think that the Dollar has the potential to rally in the short to intermediate term. Right now the U.S. Dollar Index appears to be trying to form a bottom. Obviously there is good reason to believe that the U.S. Dollar Index could reverse to the upside here. Whether it would have the strength to take out recent highs is unclear, but a correction to the upside not only seems unexpected by most market participants, but it seems plausible based on the weekend news coming out of Greece. Monday morning the Greek government is set to determine if they will agree to the demands of the Troika in exchange for the next tranche of bailout funds. If the Greek government and the Troika do not come to an agreement, the Euro could sell-off violently. Additionally there are already concerns about the next LTRO offering from the European Central Bank. The measure is to help provide European banks with additional liquidity, but there are growing concerns that the size and scope of the LTRO could have a dramatic impact on the Euro’s valuation against other currencies. Time will tell, but there are certainly catalysts which could help drive the U.S. Dollar higher. Another potential indicator that the Dollar could see higher prices in coming days was the largely unnoticed bearish price action on Friday of precious metals. 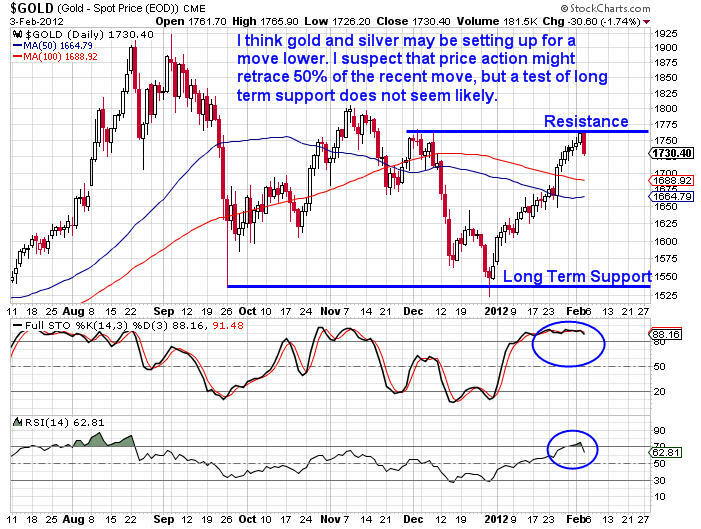 Both gold and silver have been on a tear higher over the past several weeks. Both precious metals have surged since the Federal Reserve announced that interest rates would remain near zero on the short end of the curve through 2014. However, on Friday gold and silver were both under extreme selling pressure. The move did not get much attention by the financial media. 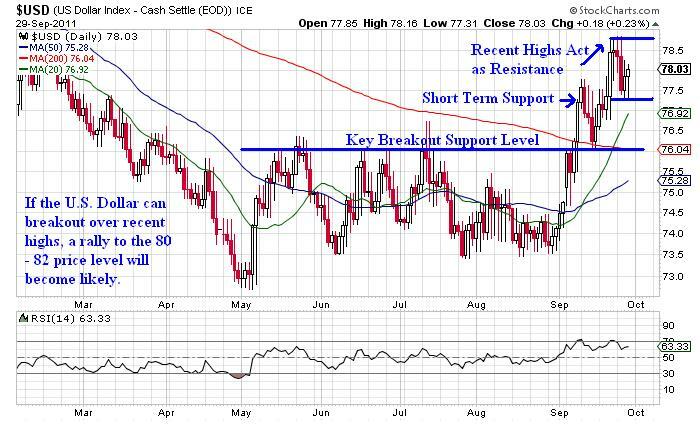 The price action in gold and silver on Friday could be another indication that the U.S. Dollar is set to rally. The daily chart of gold is shown below. Obviously the reversal on Friday in gold futures was sharp. The move represented nearly a 2% decline for the session on the price of gold. However, as long term readers know I am a gold bull. I just do not see how gold and silver do not rally in the intermediate to longer term based on the insane levels of fiat currency printing going on at all of the major central banks around the world. The macro case for gold is very strong, but the short term time frame could reveal a brief pullback. While Friday’s price action may not mark a top, nearly every indicator that I follow is screaming that stocks are overbought across all time frames. Pair that with the Greece uncertainty and LTRO considerations and suddenly the Dollar starts to look a bit more attractive. Ultimately I am not going to try to pick a top, but the evidence suggests that it might not be too many days/weeks away. http://www.thegoldandoilguy.com/wp-content/uploads/2014/11/tgaoglogo.png 0 0 admin http://www.thegoldandoilguy.com/wp-content/uploads/2014/11/tgaoglogo.png admin2012-02-06 08:52:352014-03-06 12:20:09Was Friday's Price Action in Gold Signaling a Top in the S&P 500? The current price action in the marketplace pales in comparison to the world’s geopolitical tensions and deteriorating social mood. In my trading career, I have never seen the price action in the indices react so violently to intraday headlines and rumors. 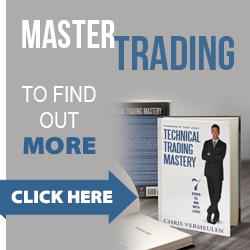 Risk is high and the types of traders profiting from this market are day traders and very short term traders with trades lasting just a couple hours to 24 hours in length. Aggressive trading which small position sizes is all that can be done right now. This is not meant to be investment advice, but more as a function of the market environment in which we find ourselves currently trading within. 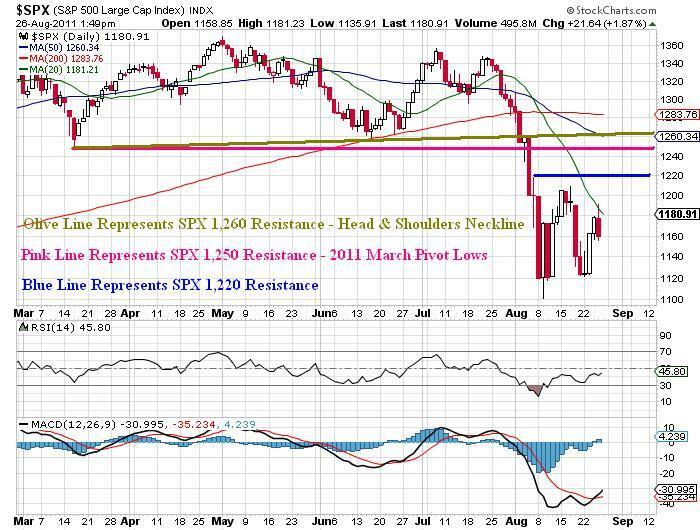 Right now it is hard to say where price action in the broader indices heads in the short-run. One headline out of Greece or Italy could dramatically alter economic history. In the intermediate term I remain neutral to bearish for a number of reasons. 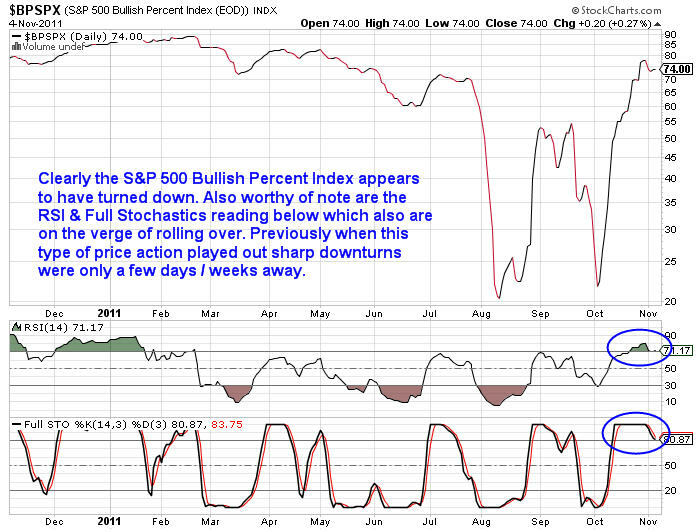 One indicator I follow is the bullish percent index on the S&P 500 which at this point is arguing for lower prices. As can be seen above, the S&P 500 Bullish Percent Index is presently at an overbought status. When looking at the relative strength and full stochastics indicators one would argue that a pullback is warranted. Historically when the S&P 500 Bullish Percent Index is this overbought, a pullback ensues which ultimately sees the S&P 500 Index selloff. The more arduous task is trying to determine just how deep the pullback on the S&P 500 Index might be. It is critical to point out that while I do believe a pullback is likely, I will not rule out a rally into the holiday season. Much of the near-term price action is going to be dictated by headlines coming out of Greece and the rest of Europe. In addition to Greece, Italy is also starting to see increased concern regarding an unsustainable fiscal condition. Depending on how the European Union handles the varying degrees of risk in the near term, we could see price action react violently in either direction. With the market capable of moving in either direction, I wanted to point out some key price levels which should act as clues regarding potential future price action in the S&P 500. 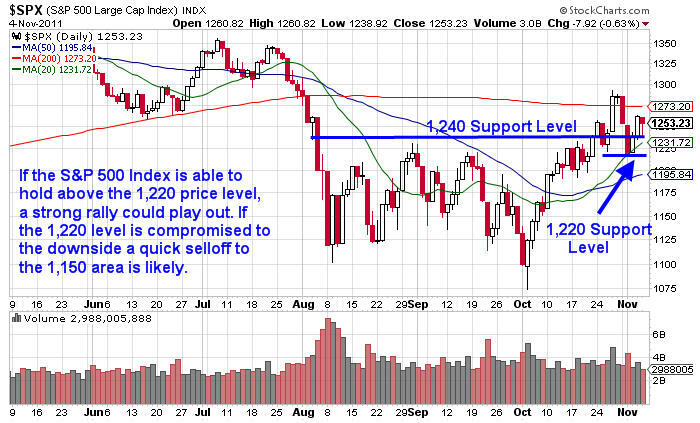 The two key support levels to monitor on the S&P 500 Index are the 1,240 and 1,220 price levels. For bullish traders and investors the key price level to monitor is the recent highs on the S&P 500 around the 1,290 area. The weekly chart below demonstrates why this price level is critical and which overhead levels will offer additional resistance should the recent highs be taken out to the upside. While I am neutral in the intermediate to longer term presently, in the short run I have to lean slightly bearish simply because of the future headline risk and also because a major head and shoulders pattern has been carved out on the hourly chart of the S&P 500 Index. This type of chart pattern is synonymous with bearish price action. Right now I remain slightly bearish, but should the head and shoulders pattern fail and/or we begin to see multiple positive reactions to news coming out of Europe a strong rally into the holiday season is likely. Unfortunately all we can do is monitor the key price levels and wait patiently for Mr. Market to tip his hand. Until we see a breakout in either direction, we could see price action inhabit the 1,220 – 1,290 price range for several weeks before we get any more clarity of future direction. Until I see a breakout, I will remain relatively neutral with a slight short term bias to the downside based on price patterns in the shorter term time frames. This is a tough market to trade in, and I don’t want to get chopped around or do any heavy lifting. I’m going to focus my attention on high probability, low risk trade setups until directional biased trades make more sense. This material should not be considered investment advice. Under no circumstances should any content from this article be used or interpreted as a recommendation to buy or sell any type of security or commodity contract. This material is not a solicitation for a trading approach to financial markets. Any investment decisions must in all cases be made by the reader or by his or her registered investment advisor. This information is for educational purposes only. I am not one to discuss fundamentals or macro views, but this situation in Europe is beginning to morph into a media frenzy. Price action in the marketplace is changing rapidly in short periods of time based on the latest press releases coming from the Eurozone summit. I cannot help but comment on the seemingly arbitrary actions coming from this high profile meeting. Nothing has happened that market participants were not already privy too. The European Union is going to strengthen their EFSF fund by levering it up roughly 4 : 1. I have yet to hear how exactly they plan on doing this, but this action was no surprise to anyone that has read an article about the sovereign debt crisis in the past month. There was also discussion about backstopping European banks’ capital position. Since European banks are holding billions (Euros) of risky sovereign debt instruments, it would make sense that their capitalization is a primary concern of Eurozone leaders based on current fiscal conditions. I would argue that the banks should be well capitalized regardless of economic or fiscal conditions in order for a nation to have a strong, vibrant economy that has the potential to grow organically. The final piece of this week’s political nonsense involves write-downs on Greek debt in the neighborhood of 50% – 60% in order to stabilize Greece’s debt to GDP ratio. Apparently Eurozone leaders want to structure the write down so as to avoid payouts by credit default swaps which act as insurance against default. How does a bond take a 50% – 60% valuation mark down without a creating an event that would trigger the payout of CDS swaps? If a write down of that magnitude does not trigger the CDS swaps, then I would argue they are useless as a tool to hedge against the default risk carried by sovereign debt instruments. If the CDS swaps do not payout as projected by European politicians, the risk assumed by those purchasing government debt obligations around the world would be altered immediately. The impact this might have on the future pricing of risk for government debt instruments could be extremely detrimental to their ability to raise funds in the private market. Additionally, the write downs would hurt European banks’ capital positions immediately. If the CDS swaps were to pay out, bank capital ratios would suffer as those who took on counter party risk would be forced to cover their obligations thereby straining capital positions even further potentially. Price action today suggested that the equity markets approved of the package that European leaders were working on. However, the biggest push higher came when news was released that China was interested in purchasing high quality debt instruments as a means to help prop up poorly capitalized banks and sovereign nations in the Eurozone through an IMF facility. The market did an immediate about-face which saw the Dollar selloff while the S&P 500 rallied higher into the close reversing a great deal of Tuesday’s losses. Inquiring minds wish to know where we go from here? I would be lying if I said I knew for sure which direction Mr. Market favored, however that did not stop me from looking for possible clues. It is rather obvious that when we look at the number of stocks trading above their 20 period moving average that momentum is running quite high presently. 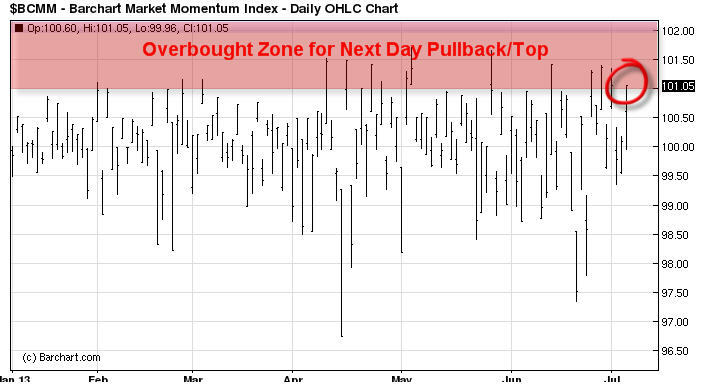 This chart would indicate that in the short-term time frames equities are currently overbought. A similar conclusion can be drawn when we look at the number of stocks trading above their 50 period moving averages. It is rather obvious at this point in time that in the short to intermediate term time frames, stocks are currently at overbought levels. This is not to say that stocks will not continue to work higher, but a pullback is becoming more and more likely. Additional evidence that would support the possibility that a pullback is likely would be the recent bottom being carved out in the price action of the U.S. Dollar Index. The U.S. Dollar has been under selling pressure since the beginning of October, but has recently started to show signs that it could be stabilizing and setting up to rally higher. 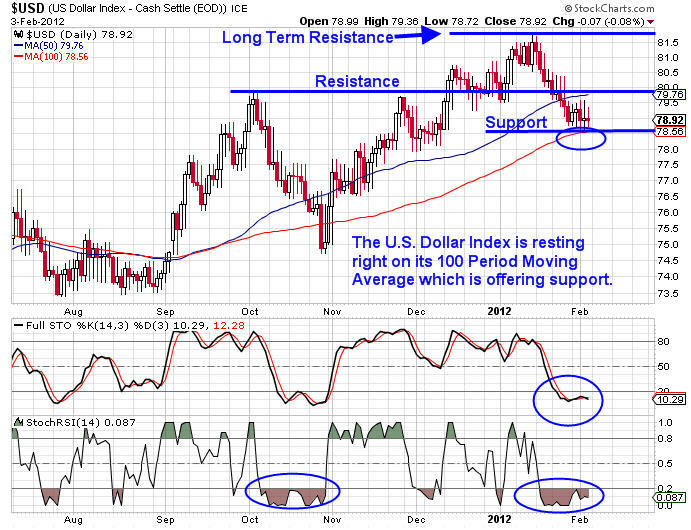 The U.S. Dollar Index is sitting right at major support and is oversold based on historical price action. If the Dollar begins to push higher in coming days and weeks it is going to push equity prices considerably lower. Other risk assets such as gold, silver, and oil would also be negatively impacted by higher Dollar prices. Members of my service know that I focus on several sectors to help give me a better idea about the broader equity markets. I regularly look at the financial sector (XLF), the Dow Jones Transportation Index (IYT), emerging markets (EEM), and the Russell 2000 Index (IWM) for clues about future price action in the S&P 500. During my regular evening scan I noticed that all 4 sector/index ETF’s are trading at or near major overhead resistance. With the exception of the Dow Jones Transportation Index (IYT), the other 3 underlying assets have yet to breakout over their August 31st highs. 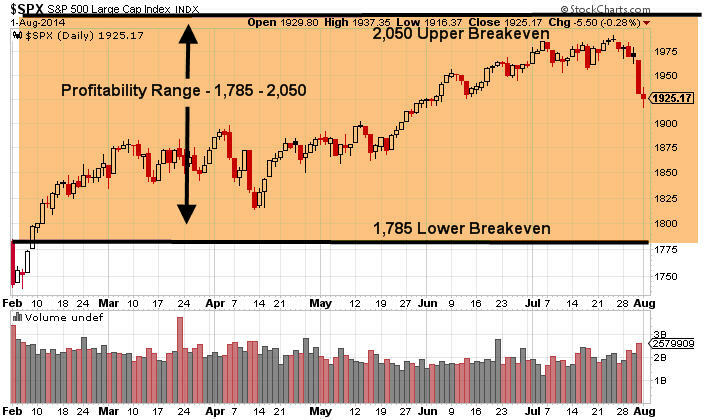 The significance of August 31st is that is the date when the S&P 500 Index put in a major reversal right at the 1,230 price level before turning lower. 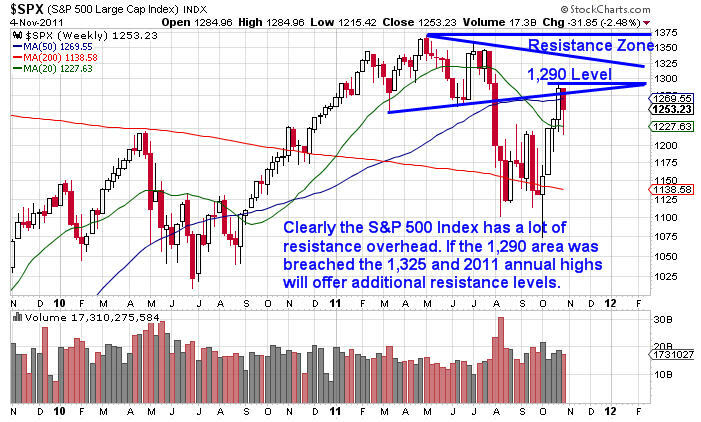 It took nearly two months to regain the 1,230 level and its significance continues to hold sway. 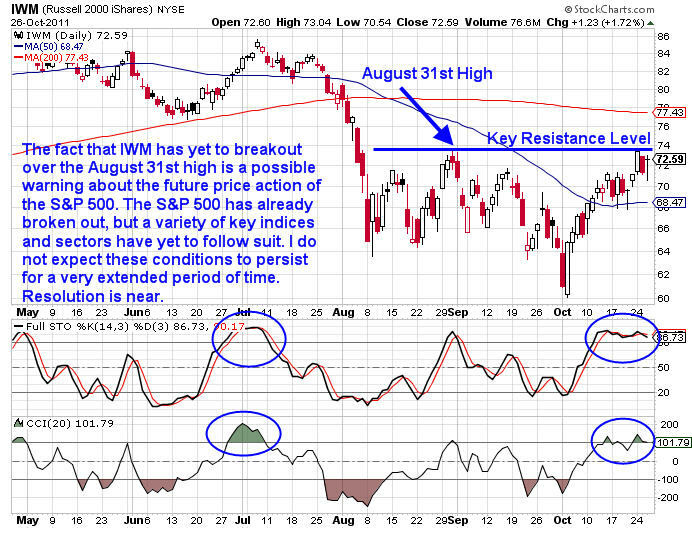 The chart above illustrates clearly that IWM has failed to breakout above the August 31st highs. I am going to be watching IWM, XLF, & EEM closely in coming days to see if they are able to breakout similarly to the S&P 500. 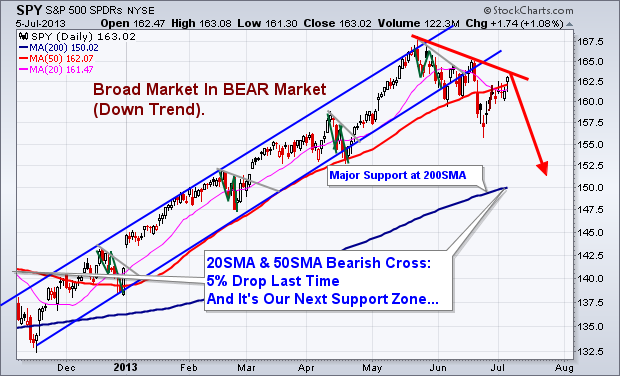 If they start to rollover, it will not be long before the S&P 500 likely follows suit. Currently the underlying signals are arguing for lower prices in the short to intermediate term. While it is entirely possible that the S&P 500 rallies higher from here, it is without question that current market conditions are overbought in the short to intermediate terms. Key sectors and indices are not showing follow through to the upside to help solidify the S&P 500’s recent break above the key 1,230 price level. 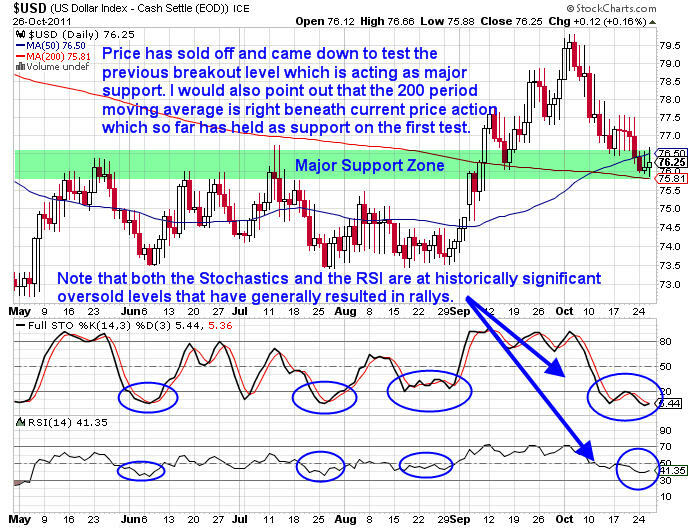 Additionally, the U.S. Dollar Index is currently trading right at key support in addition to being oversold. At this time I am not playing the S&P 500 in either direction, but I will be watching the underlying price action in the U.S. Dollar Index closely. I will be watching for additional clues in the days ahead. Market and headline risk is high presently. Subscribers of OTS have pocketed more than 150% return in the past two months. If you’d like to stay ahead of the market using My Low Risk Option Strategies and Trades check out OTS at http://www.optionstradingsignals.com/specials/index.php and take advantage of our free occasional trade ideas or a 66% coupon to sign up for daily market analysis, videos and Option Trades each week. http://www.thegoldandoilguy.com/wp-content/uploads/2014/11/tgaoglogo.png 0 0 admin http://www.thegoldandoilguy.com/wp-content/uploads/2014/11/tgaoglogo.png admin2011-09-30 16:10:402014-03-06 13:14:58Are Silver & Copper Prices Predicting a Global Recession? Now that Mr. Bernanke’s speech is old news, what was the financial media thinking exactly? A significant number of financial writers have been anticipating discussion of QE III or QE III Lite which clearly were never even on the Fed Chief’s radar this week. The focus of the Jackson Hole Summit was how to achieve long-run growth, not conduct discussion of monetary policy. QE III will not be discussed openly until the next FOMC meeting in September, which noticeably was extended to two days. Besides the extension and the Fed Chairman’s prediction of growth in the back half of the year, the remainder of Mr. Bernanke’s speech was nothing more than a brief synopsis of what he has already said in the recent past. While Chairman Bernanke focuses on the U.S. economy, I have been more inclined to monitor the action across the pond. 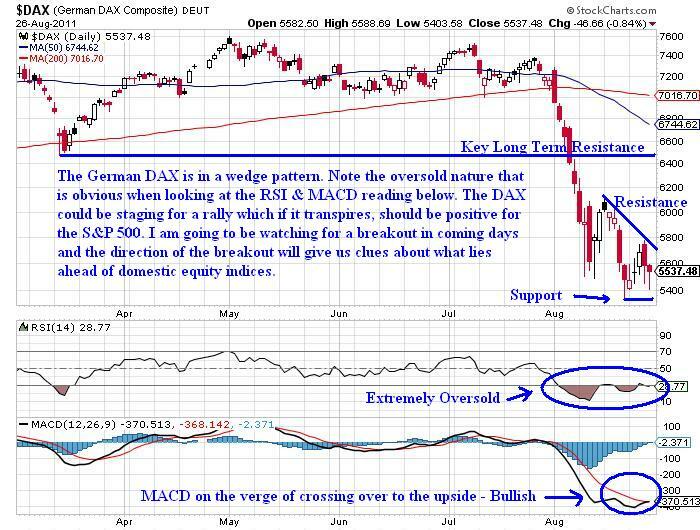 Price action in Europe is having a major impact on financial markets here in the United States. Traders are monitoring credit default swap (CDS) spreads on European sovereign debt as well as on domestic and European banks. Recently U.S. banks have seen the CDS swaps on their debt rising indicating that the marketplace believes their debt is a greater risk to investors. While the price action is nowhere near the 2008 & 2009 levels, current prices are relatively consistent with what was seen during the correction in the late spring of 2010. While there is no reason to panic at this point, this is a trend that I will be monitoring closely going forward. 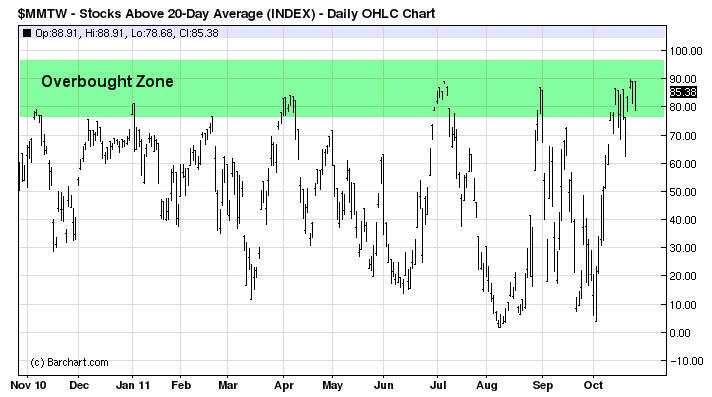 For now, I continue to believe that equity markets will rally in coming weeks as conditions are extremely oversold. The price action so far today makes sense as the wild price swings helped flush out weak hands that were long. Consequently, the snap back rally pushed shorts into stop levels as well. A significant move lower does not seem likely at this point, but a retest of the recent lows is possible, if not probable. I would remind readers that stock market crashes generally happen within the context of an oversold market. While the likelihood of a crash is remote, it is still possible and tight risk definition in this environment is warranted regardless of which side of the tape a trader is playing. 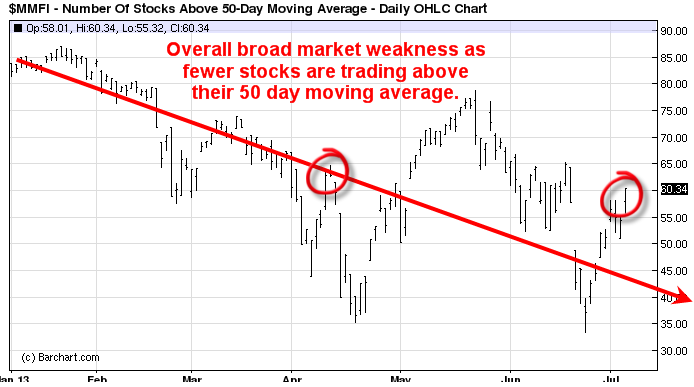 Another metric I monitor regularly is market momentum. 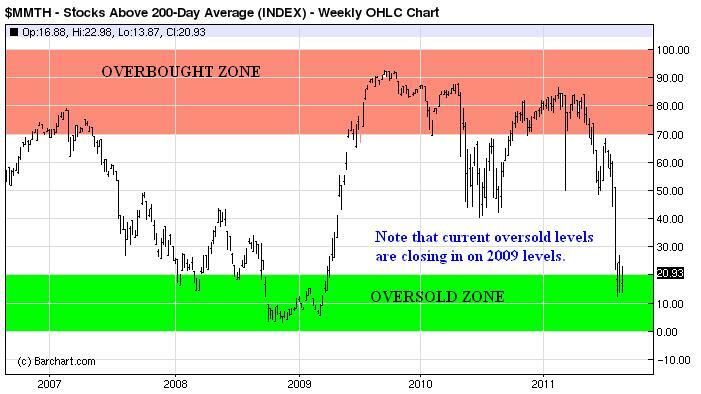 The chart below illustrates the number of domestic stocks trading above their 200 period moving averages. As can be seen below, the U.S. equity market has not been this “oversold” since back in 2009. Chart courtesy of Barchart.com. My most recent article argued that gold prices were going parabolic and that a pullback was likely. We have seen a major pullback in gold prices. Admittedly, I was about $200 an ounce early on my call, but members of my service were able to capitalize on an option trade that captured 32% based on maximum risk through the use of a double calendar spread. While my timing was not precise, the juiced volatility in the GLD options allowed me to roll contracts forward and make additional adjustments to produce a strong gain for the service. While it is far too early to determine if a head and shoulders pattern will be carved out or if lower prices take place, I am of the opinion that this selloff will offer an attractive entry point for longer term investors. At this point it is a bit too early to get involved, but if my analysis is accurate the next leg of the gold bull market will be potentially extreme. While I believe stocks will rally in the short to intermediate term, I am of the opinion that we have officially entered the next phase of the bear market. The next wave lower in stocks is going to be just as severe as the likely rally in gold. The reason I believe gold will rally is primarily due to future weakness in Europe. If European banks have a credit crisis, a sovereign nation unexpectedly defaults, Germany leaves the Eurozone, or a currency crisis transpires gold prices should soar while U.S. equity prices tank. The next few weeks are going to be very telling about the future in domestic markets. Is this just a correction that pushes stocks higher by the end of the year, or is this the beginning of something far worse? For now I am going with the latter, but price action in coming weeks will offer clues about what lies ahead for U.S. equity markets. Right now this is nothing more than speculation, but the next few months should be very interesting. Risk remains exceedingly high. 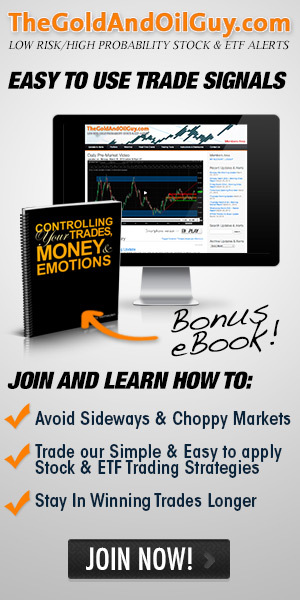 Join Now at http://www.optionstradingsignals.com/specials/index.php for a 24 hour 66% off coupon. The past few weeks have been fast moving with fearful investors clearly in control. As we all know fear is the most powerful force in the financial market and when the hedge funds and the masses get spooked they all dart in one direction like a school of fish. Watching the charts and volume levels it’s clear that money was/is flowing out of stocks and into precious metals as the risk off safe play. 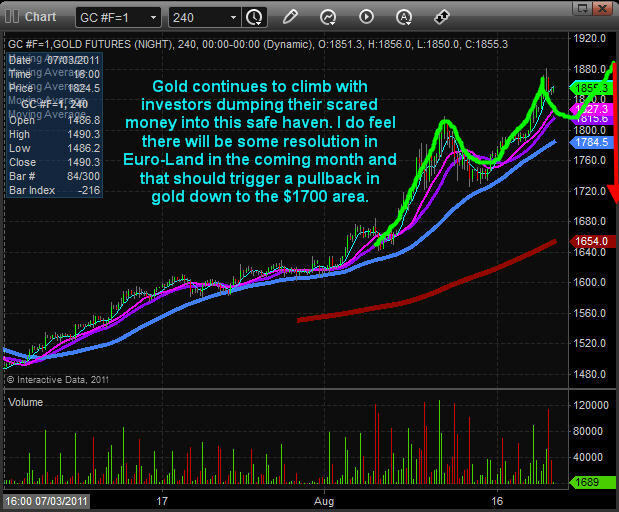 This was explained in last week’s report on how the GLD etf can be used as a fear/sentiment indicator (read here). To make a long story short, I feel as though Euro-Land is going through something similar to what we (the USA) went through in late 2008 and first quarter of 2009. Keeping my analysis simple and to the point it’s very likely that Euro-Land will resolve their financial issues and their stock markets will bottom in the next month or so… If their market bottoms, so will the US market, which will be perfect timing as the market is currently oversold, sentiment is now turning bearish and we have had a sizable pullback in line with normal bull market corrections. My thinking looking forward 2-6 weeks is that stocks rally, financials rocket higher, bond prices fall, gold falls and oil rises as it will be a risk off trading environment again. Of course all this would happen after Euro-Land resolves some of their key financial issues. I’m being very optimistic here but we could be nearing a major low that could kick start another massive 1 year rally. Stepping away from that longer term outlook let’s take a peek at the shorter term trends for oil, gold and stocks. 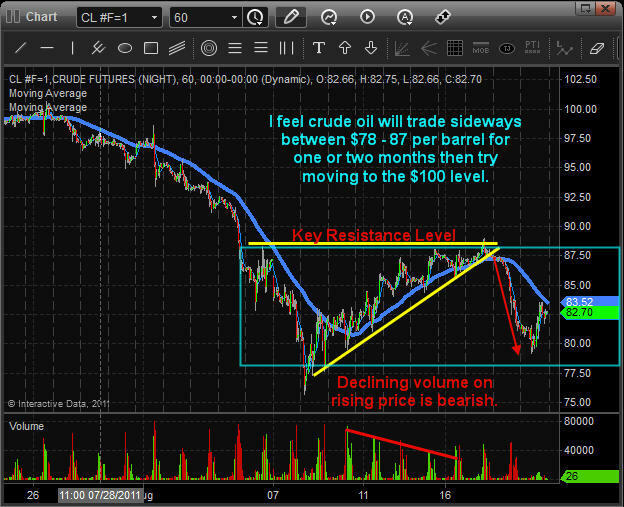 The recent price action for crude oil remains bearish/neutral in my opinion. We saw a drift higher into resistance with declining volume then a sharp pullback on heavy volume. This tells me oil remains in a down trend. It may be forming a base which would act as a launch pad in the coming weeks for higher prices but only time will tell and I will update as price unfolds. Gold has been performing very well for our entry point but the recent price action is starting to look toppy. Gold and many commodities regularly form this pattern of three wave pushes to new highs just before a sizable correction takes place. I am bullish on gold long term and for a few more weeks, but I do feel as though there will be a multi month correction in the price of gold (Read More) soon so be sure to tighten your protective stops as price moves higher. 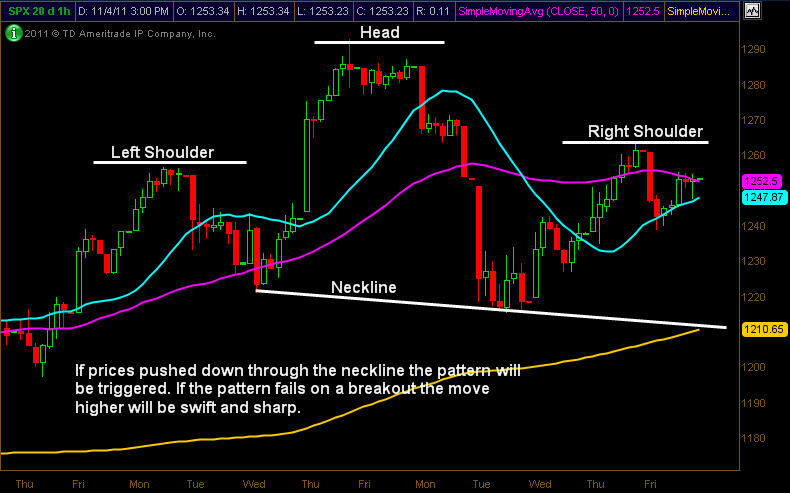 The stock market has been hit hard and a lot of damage has also been done to the charts on a technical stand point. The amount of damage and fear that has happening generally takes some time to stabilize and heal before another move takes place. Until Euro-Land resolves some of their major issues the US market will be held hostage and under pressure. 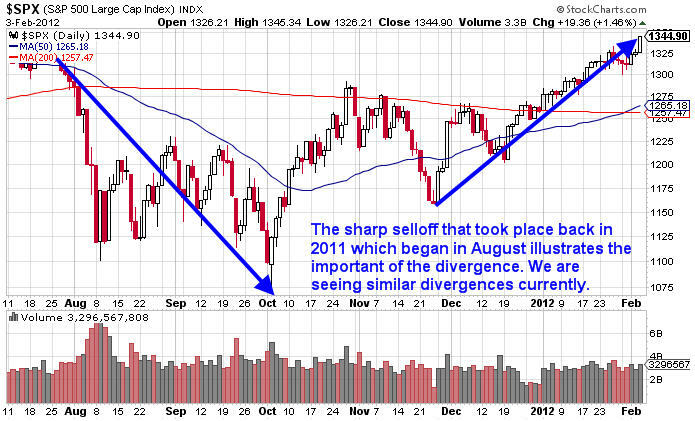 So I anticipate several weeks of volatility and wild daily price swings similar to what we saw in July of 2010. This type of trading environment can work very well for options traders (Read More). In short, the market price action is favoring very short term traders (day traders). We are seeing complete price swings which can normally be swing traded happen in just hours… Until we get another extreme setup or stabilization (less big headline news) in the market we will be more of a spectator than a trader to preserve capital.